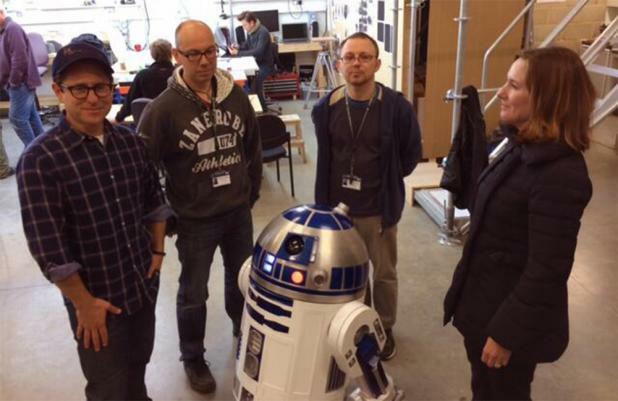 R2-D2 for Star Wars return? R2-D2 may return in 'Star Wars: Episode VII'. Director J.J. Abrams has appeared to hint the robotic character, which has been in all six of the previous space films, will be part of the new movie. Abrams posted a photo of himself, Lucasfilm president Kathleen Kennedy and some crew members posing alongside R2-D2 on his production company Bad Robot's Twitter account yesterday (14.11.13). The caption reads: "Hi from the workshop! #StarWarsVII (sic)"
Kenny Baker played the diminutive robot in the 'Star Wars' series, while Ben Burtt voiced the character. It's not yet known if R2-D2's partner-in-crime, gold-clad C-3PO, will be in the film also. Original 'Star Wars' cast members Harrison Ford, Mark Hamill and Carrie Fisher are expected to reprise their famous roles, but the cast has not yet been confirmed yet. Disney - which bought the rights to the franchise in a $4 billion deal last year - is currently holding online video auditions for the film after completing nationwide open auditions in UK cities such as London, Bristol, Dublin and Glasgow last week.